Gotta love the fact that, with Oliver Perez (nice signing, Minaya) out, that puts the Mets with 100 million dollars of talent on the injury list. Put it this way; that's about 3 times what the Florida Marlins pay their entire team, who lead them by about 11 games. I know it's ridiculously early, and that preseason doesn't mean a thing, but I have a gut feeling, just a sinking gut feeling, that the Dallas Cowboys are going to be bad. Very, very bad. Gotta give a "My Bad" shout out to the San Francisco Giants. Back in March, I picked them to be bad—and just went off on Barry Zito. Ooops. Not only did the Giants sweep everybody's favorite resurgent team, the Rockies, but they pulled into a virtual tie with the Rockies for the last playoff spot. And Mr. Zito—he of the galactically huge contract, has dropped his ERA south of 4.00. Well done, Barry!!! Now, a lot of the things I said in March are still true—their starting outfield has 18 HRs, or 23 less than Albert Pujols, and I still don't like the Rentaria signing—but their pitching, starting and relieving has done so much of the heavy lifting, that they no have a puncher's chance to take the wild card. Do you think Eric Mangini might actually wait until the Browns are walking out of the tunnel on Opening Day, and then lean over to Brady Quinn and say "You're starting." Or will he text him right before the kickoff? 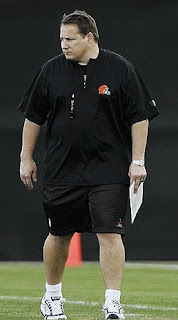 Everyone knows it's Quinn's job already, Coach. Just name him. Nice to see Girardi getting some love from the national MSM. He deserves it, considering all the crap he has to put up with locally. And another guy who deserves some love: Brian Cashman. How nice has the Jerry Hairston trade for the Yankees. The guys is batting .316 with a 151 OPS+. But more importantly, you can plug him in anywhere, and the Yankees have; having played LF, RF, 3B, SS and CF, for the Yankees since August 1st—aside from the normal PH and PR. And all this for a kid who was batting .260 in A ball? Way to go with the mad trade skills, Cashman! Time to call 2007 first round pick, Jarvis Moss a Mega-Bust. Word is, the new regime in Denver wants a clean start with their team and have no qualms about cutting the first-rounder. Taken in front of players like Michael Griffith, Jon Beason, Aaron Ross & Eric Weddle, Moss might break land speed record for being a first round pick to out of the NFL. Can someone please explain to me what the heck happened to the Cubs? 134 million spent for a roster with guys like Derrick Lee, Aramis Ramirez, Milton Bradley, Alfonso Soriano, and a pitching staff with Rich Harden, Carlos Zambrano, Ryan Dempster, & Ted Lilly—and all they get is 2 games over .500. OK, I get Geovany Soto fell off a cliff, Soriano has seemingly forgot what a good pitch to swing at looks like and that Sean Marshall isn't as good as he has been in the past either. That said, Fukudome is showing signs of getting it, Ted Lilly is having a career year, and Randy Wells has been a Godsend. Bottom line, with all that talent, there is no way on Earth the Cubs should be trailing by 10 games in that division. Playing the Pirates, Reds & Astros alone should make the Cubs 15 games over .500. Makes no sense. Here's a sick fact: Philip Rivers has the same QB rating as Tom Brady 92.9. And hell, considering that Brady has had Moss to throw to 2007 and complied an absolutely stupid 117.2 passer rating, it's all the more impressive that Rivers has the same rating as Brady. Of course, we'll see how Rivers does in the long run but so far, nice start. And finally, Coach McDaniels is making waves again in Denver. No, not for alienating his best plaers again, but for.....sporting a Bill Belichek type grey hoodies. As of this report he has not hacked off the sleeves, drunk-child style, as Bill often d oes. 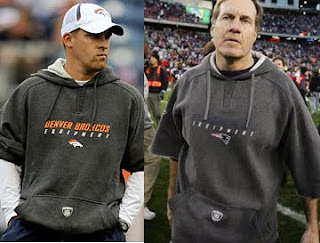 But did McDaniels take fashion tips from Coach Belichek during his time in New England as well as football tips? Bill Belichek was asked that question. "Yeah, we spent a lot of time on that. Next question." I won't cry for the Mets, nope. I thought Zito was too good for those numbers he was putting up but not good enough for those $$$ he was earning. Good to see him doing better. I assume you are quoting Rivers' rating from pre-season. If so, then put an asterisk next to it, he did it against the Falcons defenseless defense. They are going for the "score more than we give up" attack this season. They will give up a lot...They also are doomed btw, they have NEVER had winning records in back to back seasons, EVER. They were 11-5 last year. Toast.